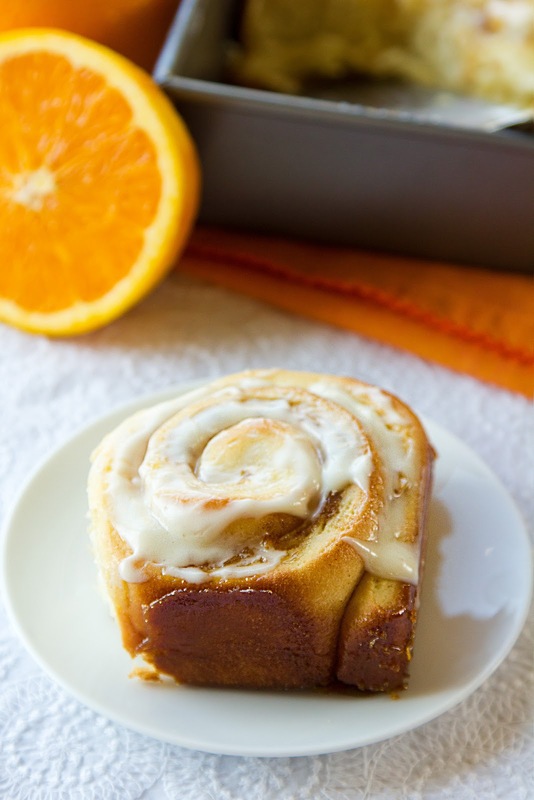 Orange Marmalade Cinnamon Rolls - Hi, friend Popular Recipes, in this article entitled Orange Marmalade Cinnamon Rolls, we have prepared this article well and concise to be easy to understand for you to read and can be taken inside information. hopefully the contents of the post Article baking, Article food, Article recipe, Article rolls, that we write this you can understand and useful. okay, happy reading. Ever since I took part in the Willow Bird Baking challenges this past fall, I've been wanting to make orange sweet rolls. There was something about them that intrigued me and I definitely wanted to see what they were all about. This Sunday I had some free time so I gave them a try! When it came down to the recipe I decided to use as much orange flavor as possible while still trying to incorporate a traditional filling into the rolls. Turns out that was a great idea! The cinnamon flavor was subtle but really complimented the sweet and citrusy flavor of the marmalade inside. To finish them off I topped the rolls with a zesty cream cheese frosting which melted nicely over them. They were fluffy, full of citrus flavor and dripping with a gooey creamy frosting- absolutely delicious! Stephen was a huge fan and so was I! These will definitely go into my "must make again soon" pile! 1. In a glass 2-cup measuring cup, warm milk in the microwave for 45 seconds on high. Sprinkle in yeast and 2 tbsp. of sugar (subtract it from the ½ c. of sugar listed above) and mix gently. Let mixture stand for 5 minutes or until bubbly and foamy. 2. Meanwhile, combine remaining sugar, butter, eggs, salt, extract and zest into the bowl of a stand mixer fitted with the paddle attachment. Mix for 15 seconds or until mixture is just combined. Once yeast/milk mixture is bubbly, with mixing speed on low, alternate liquid and flour (use 4½ c. and then add the extra ½ c. if needed) until combined. 3. Switch to the hook attachment and "knead" dough on the lowest speed for 6-8 minutes or until smooth and firm. Remove dough from bowl and place into a large lightly greased metal or glass bowl. Cover tightly with plastic wrap and allow to rise for 1½ hours. 4. Once dough has risen, roll out into a large rectangle. Spread butter on top, then marmalade. In a small mixing bowl combine brown sugar, cinnamon, vanilla and orange zest. Sprinkle on top of butter/marmalade mixture. Roll the dough lengthwise into a large log. Using dental floss cut in half, then continue by cutting each section in half and repeating (I do it this way to get even cuts and an even amount of rolls). 5. Place rolls into a large 9x13 pan or two 9" pie pans (you will want to use baking spray to prevent them from sticking to the bottoms and sides) leaving at least an inch around each roll. Cover with plastic wrap and allow to rise for 30 more minutes. Once rolls have risen, place in the oven at 400 degrees for 18-20 minutes or until golden brown on top. While rolls bake, prepare the glaze by combining all ingredients in a large bowl and mixing until smooth. 6. Remove rolls from oven and allow to cool for 15 minutes before pouring the frosting over top. Spread the frosting evenly. Allow to sit for an additional 10 minutes before serving. Thank You and Good article Orange Marmalade Cinnamon Rolls this time, hopefully can benefit for you all. see you in other article postings.